Posted on September 8, 2015 by Barry V.
There are distinct rhythms to the natural year – times when everything is happening at once and other times when nature seems to slow down and take a breather. By August, most birds have raised a brood (or several broods). Young birds have left the nest and are learning to make their way in the world. 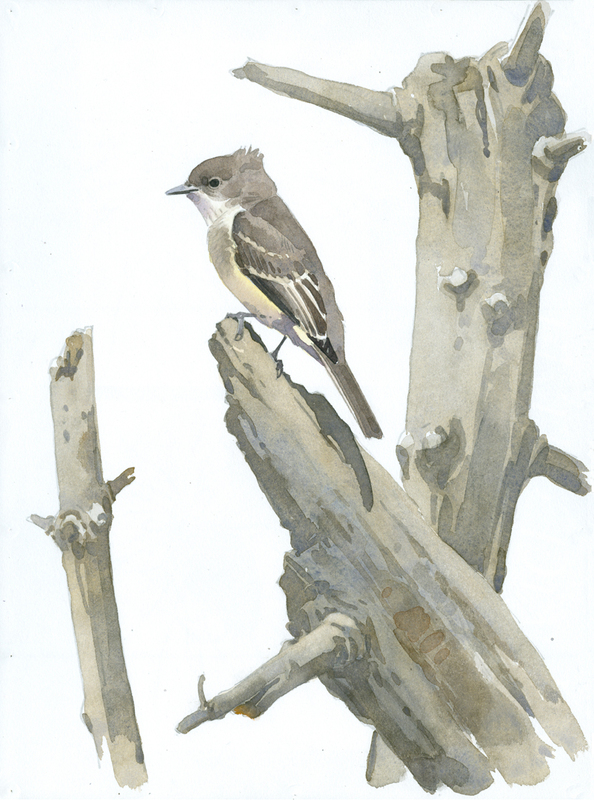 At Waseeka Wildlife Sanctuary, the most common birds at the pond today were eastern phoebes and a good percentage of these were young birds. You could tell them from the adults by a soft lemony wash on the undersides and more clearly defined wing bars. I wondered if phoebe adults customarily bring their broods to places like this after leaving the nest – spots where there’s lots of food (i.e. insects) and many open perches from which to hunt. Or perhaps these are simply wandering youngsters that find these places on their own. The big nest out in the middle of the pond is vacant, too, but I had read that it has been used by a pair of ospreys for a number of years, so I was keeping an ear and an eye out for them. 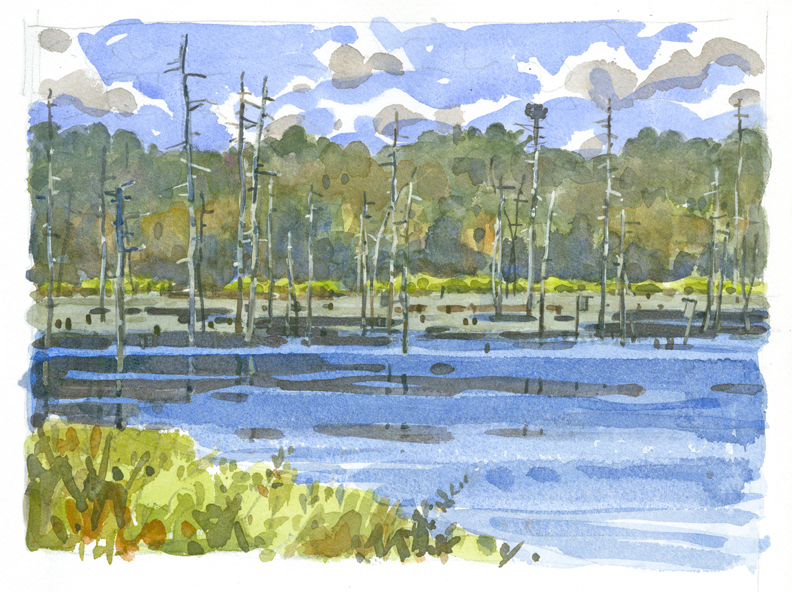 Around 1 pm, I hear some high pitched, chirping notes and observed a large bird land in a big dead pine on the far shore of the pond. Putting my scope on the tree, I noticed not one but TWO adult ospreys – one of them actively devouring a fish! Even in my scope the birds are tiny, and abit too far off for serious drawing. The shorelines at Waseeka are rich and varied. 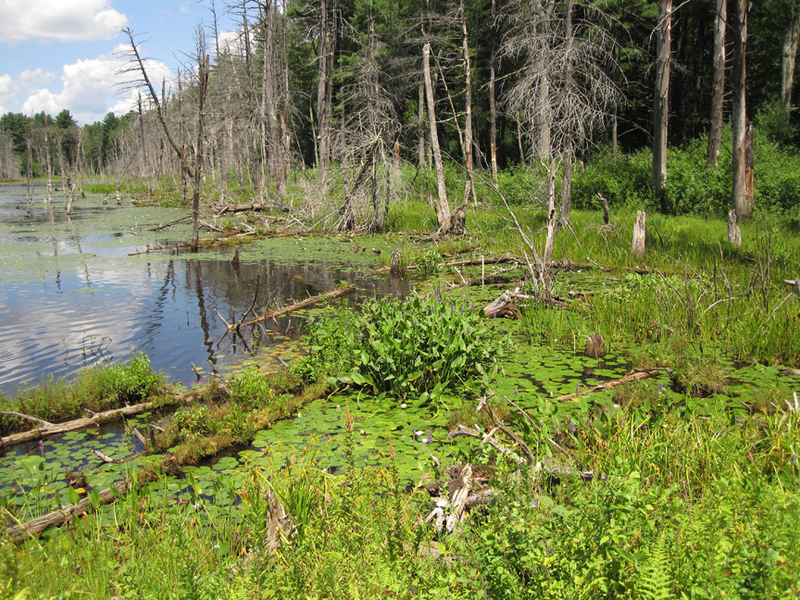 Beaver activity flooded these shores some years ago and drowned many trees, opening up the canopy and encouraging lush undergrowth. 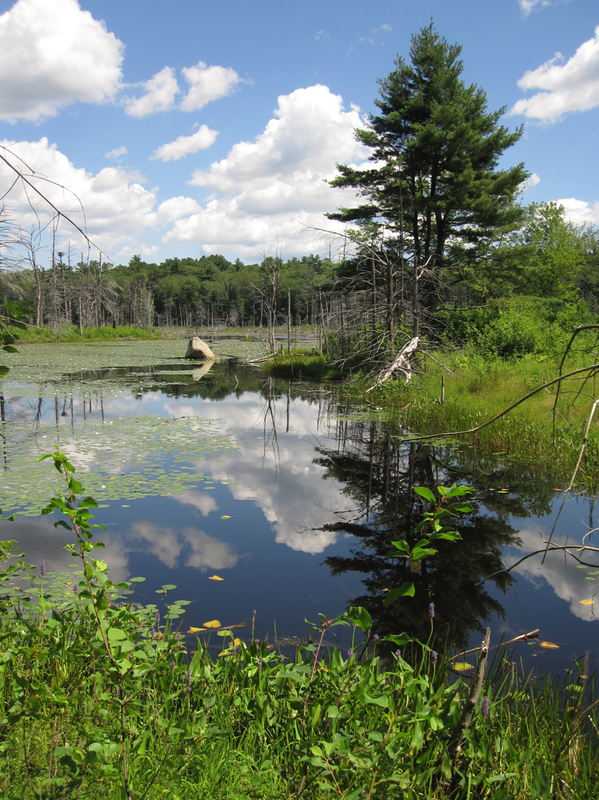 When the pond levels were restored, these open shorelines quickly regenerated with a striking variety of plants. Sweet pepperbush and pickerel weed are in full bloom along the shore today. 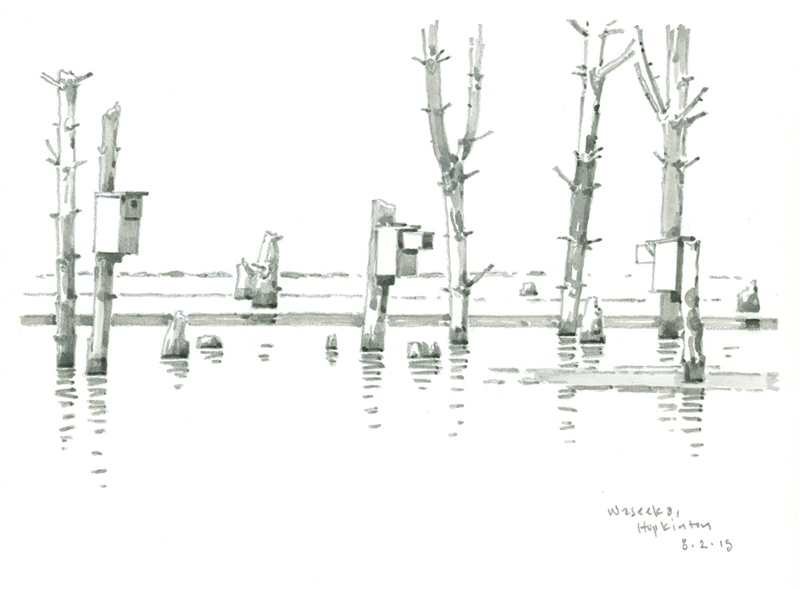 Many nest boxes have been mounted in the pond, attached to standing dead trees, and I presume some of these are used by breeding wood ducks and hooded mergansers. The boxes create interesting rhythms among the vertical trunks. I do a simple line drawing and add a wash of ivory black to establish the light. 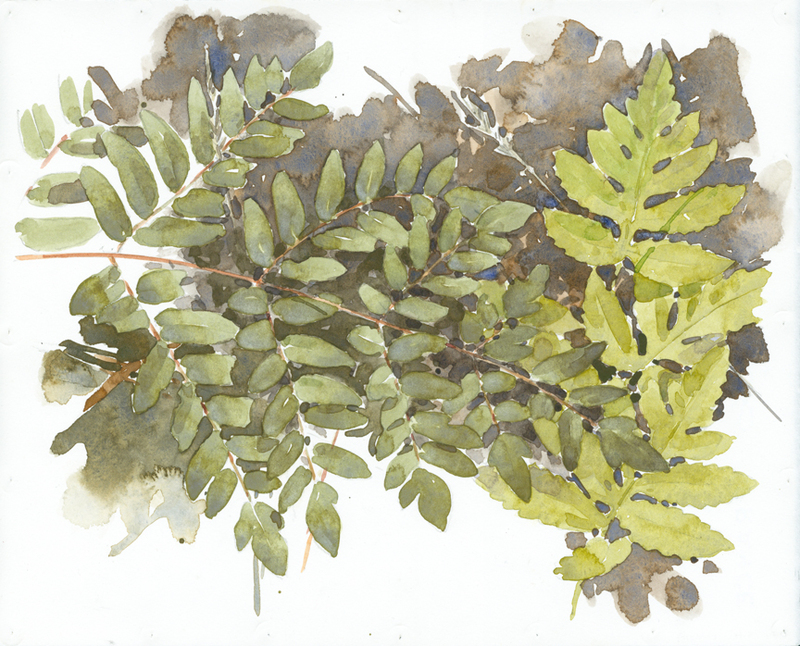 This entry was posted in Artists, Barry Van Dusen Residency, Natural History, News and tagged Barry Van Dusen, Beaver, Birds, Eastern Phoebe, Hooded mergansers, Hopkinton, Ivory black wash, Landscape, nest boxes, Osprey, Osprey Nest, pickerel weed, Pond, royal fern, sensitive fern, Sketching, Spotting Scope, Sweet Pepper Bush, Waseeka Wildlife Sanctuary, Watercolors, Wildlife Sanctuary, Wood duck on September 8, 2015 by Barry V..